As a REALTOR®, a designation or certification helps you stand out in the industry – to other professionals, clients and potential clients – and achieve a higher level of success. 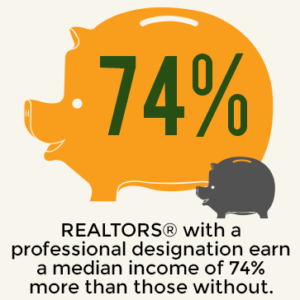 REALTORS® with a professional designation earn a median income of 74% more than those without, according to a recent NAR member survey. Designation courses allow you to stay on top of the latest trends and tools for REALTORS® and exchange experiences and business referrals with other industry professionals. In today’s competitive business environment, it often takes more than just motivation and initiative to succeed. Earning the Graduate, REALTOR® Institute (GRI) designation is a way to stand out to prospective homebuyers and sellers as a REALTOR® who has gained in-depth knowledge on technical subjects as well as the fundamentals of real estate. KAR now exclusively offers the Graduate REALTOR® Institute (GRI) designation in Kansas! KAR’s Keynote online video courses are now approved for CRS Elective credit! CRS designees distinguish themselves from a million other agents in the residential real estate industry and earn more than triple the income of an average REALTOR® and complete twice as many transactions. View the Keynote courses available for CRS Elective credit. Learn more about the CRS designation.Learn more about the CRS designation. The National Association of REALTORS® and its affiliated Institutes, Societies, and Councils provide a wide-range of programs and services that assist members in increasing skills, proficiency, and knowledge. See a full listing of NAR Designations here. REALTOR® University is a global, online campus expanding education in what you know best: real estate. It combines specialized, in-depth knowledge of the industry with practical business skills. Tailor a curriculum to focus on what’s most relevant to your business and career goals. REALTOR® University allows you to concentrate in five areas ranging from Asset & Property Management to Real Estate Association Management. Learn more at the REALTOR® University website.